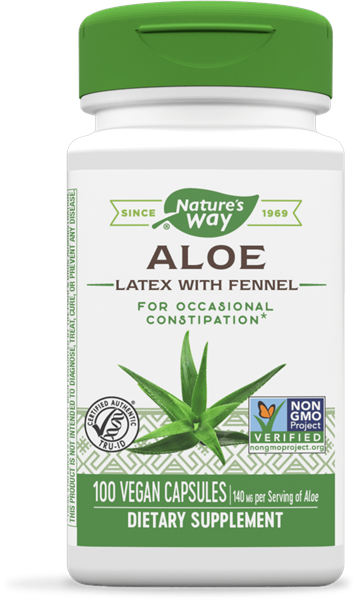 Aloe Vera / 100 Vcaps - Nature's Way®. Adults and children age 12 years and over: take 1 capsule with a full glass (8 ounces) of liquid at bedtime. Not recommended for children under 12 years of age. Do not take more than 1 capsule in a 24-hour period. Do not take for more than 7 days, as frequent or prolonged use may result in dependence. Do not exceed recommended dosage. Not for long term use. Do not use when nausea or vomiting are present, unless directed by a healthcare professional. Do not use if you have a history of, or currently have, intestinal disease. Consult a healthcare professional if you notice a sudden change in bowel habits that persist for more than two weeks. If you experience rectal bleeding, or failure to move bowels with use, it may indicate a serious condition. Discontinue use and consult a healthcare professional.